Sire Buckeroos Top Cat 33.5"
Lucky Four Wranglers Buccaneer 29.75"
Dam Hunt House Farms All Eyes On Me 31.25"
Hobby Horses Little Belle 29.75"
knows how to behave himself. Will pasture breed as well. Without a doubt, Buckeroo is the most well-known miniature stallion in the world today. stallions that can claim being sired by and siring National Grand Champions. is a stunning older son of Buckeroo. T.C. has the genetic ability to consistently produce those sought after dilute colors. We are excited to have this outstanding stallion as our premier stallion. Homozygous (CrCr), double dilute cream horses. Double dilute horses will always pass on a copy of the cream gene to its foals. cream is known as a cremello. on passing the cream gene on to its offspring. T.C. 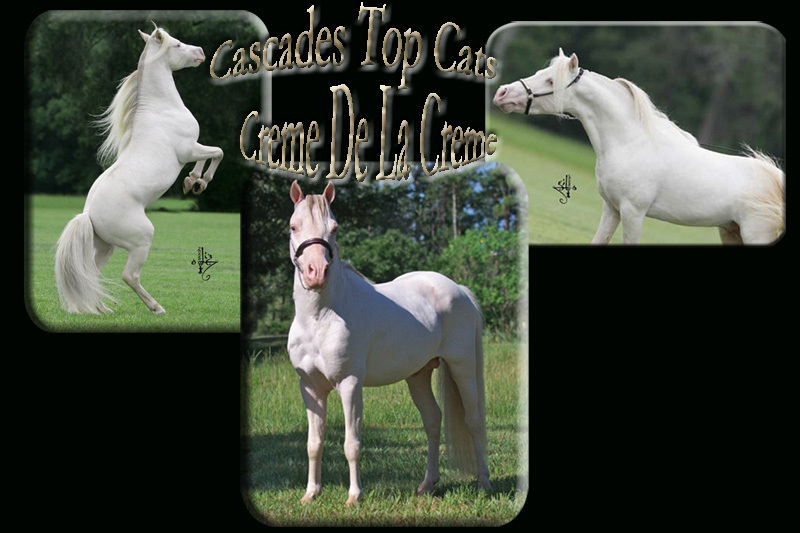 sire Buckeroos Top Cat is a stunning stallion with great presence and refined conformation. He is a true sire of significance in this industry. can be greatly increased when providing the color genetics of the sire and dam. and 3 consecutive National Grand Champion Get of Sire Titles. and the important "Look At Me" attitude. and Performance over the years in AMHA and AMHR Nationals.